i often notice that aging produces a variety of seemingly surprising or inappropriate reaction to thoughts of things newly or always around me whether natural or manmade. simply put, i get into them what seems to be more than i ever have. one result is a desire/need to record or pass on my new 'discoveries'. but there is an even more surprising aspect of the phenomenon. i find that often what catches my eye has been literally in plain sight and maybe even all around me all along. art deco generally and what i call courthouse deco has in fact been all around my workspaces, courthouses at a number of venue, and within my view all round oklahoma city, even in capitol hill, and not just in tulsey town. tulsa is still legitimately oklahoma's official art deco capitol and my official starting place for appreciating art deco. art deco is instantly in sight downtown and elsewhere and the community trumpets its art deco. oklahoma city's art deco came into view for me more when the courthouse was massively - and wonderfully refurbished in the late 90's. the refurbishing accented the art deco within, particularly by wonderful subtle but strong painting of the interior. once my eyes were reopened i noticed that city hall and the civic center auditorium directly to the west had art deco exteriors and the first national bank building was art decvo all the way. 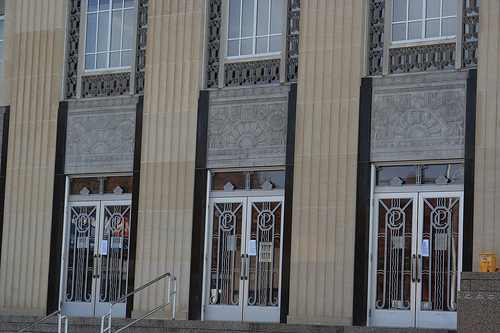 and i started noticing the art deco in other courthouses around here, particularly grady and pott counties. by my count there are ten courthouses that have some claim to being art deco and one that i think deserves mention with an asterisk. most were built in the 1930's. two architects, solomon layton and walter vahlberg were responsible for 5 of the 10 but apparently did not collaborate. almost all have the outside trappings of art deco and some show art deco on the inside. the outsides typically display half sculptures coming out of the granite walls - i saw them described as friezes. these sometimes geometrical design and other times iless than successful attempts to show indian people and white settlers symbolically. the building also often use aluminm for elaborate window grills and sometimes the sculpture. the oklahoma county was built in 1937 with pwa funds. here is where it all started for me. art deco abounds inside and out. check out the whole front of the building, the mailboxes by the elevator with the streamline airplane image, the light fixtures. there are so many things to see that i suspect i'll need to make some kind of slide show and the whole outside but especially take a little while to stand on the second floor and look around. bad and good has happened to me on this floor in the 40 years i have been visiting. today i often stop just to take in the view to make the day bearable. the floor was originally the first floor which you entered from the front steps until 'security concerns' closed those doors. that's truly sad because walking past the outside onto this floor was meant to be. the courthouse in chickasha was designed by the same architect as oklahoma county courthouse some three years earlier and like it contains wonderful interior art deco details in the stairways, halls and courtrooms. unfortunately it has not had a similar spruce up update which it very much deserves. the entrance includes lantern structures which reappear before later in oklahoma county and a more bizarre than average version of the classic frieze. i include this courthouse here because it was designed by the same architect some eight years before grady. 1926 is a little early for art deco and there would seem to be a question whether it qualifies for the term. i spot the decorations at the top of each floor and on the second floor east wall facing to the right. one person described it as having 'an interesting wedding cake look'. 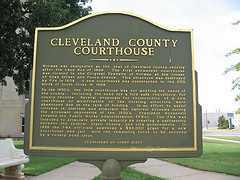 the cleveland county courthouse was built in 1939. it's been described as the popular combination of ' the classical revival form with art deco ornamentation. the upstairs courtooms in the old building and stairways continue art deco based looks. 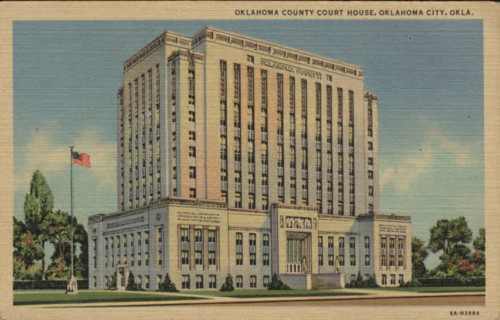 i've included this 1931 courthouse here because the architect is the same. this courthouse is obscure to me but it has two claims to fame, one for art deco period. it's arguably art deco in design but has a somewhat bizarre color scheme - a kind of turquoise blue upper floor. the courthouse is also famous for posting a copy of the ten commandments on the grounds. the tenth circuit court of appeals had to order its removal for obvious constitutional grounds. the fact that adultery was misspelled on the sign was not listed as a grounds. i've always liked the inside of the pott county courthouse - except for the stairs. 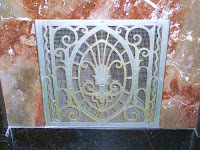 signs of art deco are present in the stairways, the courtrooms and on the outside. the single relief aluminum indian images are singular but i don't yet have a picture of them. 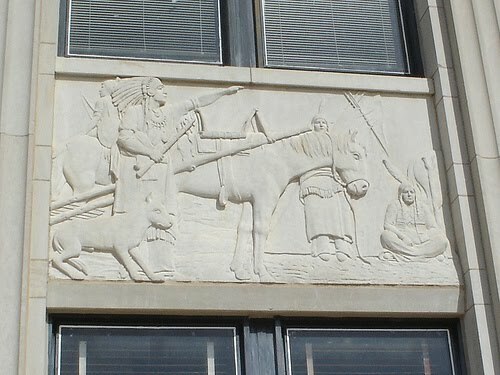 the pawnee county courthouse is genuine art deco on the outside but the most memorable decoration is the 4 relief works. two on the left, literally the west, show indians facing off against the images on the4 east of approaching settlers. for now i'll content with myself with notes as to four other counties. 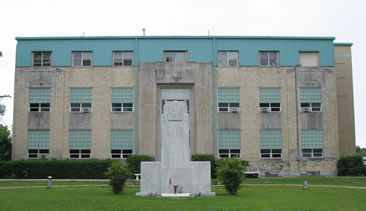 the adair county courthouse in stilwell was bilt in 1931 and includes indian images in the art deco front decorations. 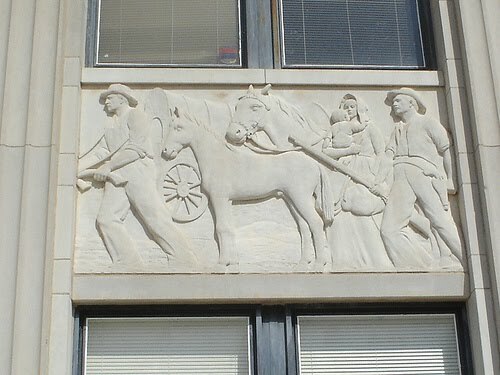 the woodward county courthouse built in 1936 has classic art deco accutrements on the outside. the wagoner county courthouse in wagoner was built in the late 30's but seems to have has its art deco moments covered up. it is however still decribed as art deco. I have not been in the refurbished pontotoc county courthouse in ada but two things have always made me think art deco when i'm near the place. first the suggs clinic, a classic art deco building is right across the street. 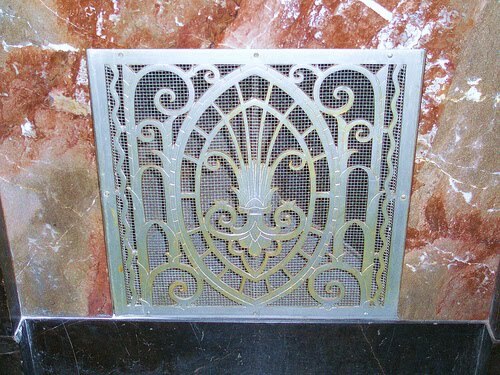 second, the courthouse elevator doors have always sported a clear art deco pc insignia. i'd love to add inside pictures to this blog and have the whole subject develop more. for now i just suggest you avoid the classic courthouse bad times by looking around at the art deco. A number of flickr sites have courthouse pictures. One of the most comprehensive is available at 'courthouselover's' oklahoma collection. 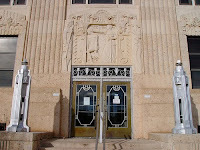 I combined other pictures on flickr for two collections: oklahoma courthouse deco and deco ii. 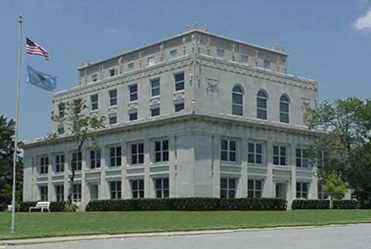 Three websites provide good materials on the oklahoma county courthouse: two with good histories of the courthouse: oklahoma county's site and living places. oklahoma county lawyer doug loudenback's blog includes a Civic Center page which gives the history of the whole area from the courthouse to the police station which was a major civic improvement plan in the 1930's. A tulsa art deco website has a good art deco primer. making art from your profession by appraising the architecture where you needs must go to practice - an admirable aesthetic, Esquire Bwendo, hurrah for you!